"We do not believe that human beings should ever be sacrificed for the benefit of another. We thought we left that at Nuremberg more than fifty years ago." Colleen Parro, spokesperson for the Republican National Coalition for Life, 2001-JUN. "I just cannot equate a child living in the womb, with moving toes and fingers and a beating heart, with a frozen embryo sitting in a lab somewhere." Senator Orrin Hatch (R-UT) on NBC's Meet the Press. "Do I want to see again? Dance again? Hear like I once did? I do not want those things at the cost of any living person and I consider live embryos to be people." Testimony of a disabled woman at a Congressional hearing. "I am acutely aware of the ethical sensitivities that have been expressed regarding the sources of stem cell lines. But, surely, obtaining cells from legally obtained abortants or from early stage embryos that are destined to be discarded in the course of IVF procedures and making them available for potentially life-saving purposes would be viewed as ethically permissible if not a moral imperative." Paul Berg, Cahill Professor of Biochemistry, Emeritus. "In embryonic stem cells may lie the key to healing within the human body..." Yvette Cooper, Junior health minister, British government, 2000-DEC.
"Stem cell research holds the promise of hope for 100 million people living with incurable diseases from diabetes to heart conditions to Alzheimer's to Parkinson's, ALS, MS, and spinal cord injury. It will affect the entire American family. I believe this is why we find in this new survey such strong support from people with such diverse religious and ethical beliefs." Christopher Reeve, Chairman of the Christopher Reeve Paralysis Foundation. He suffered a spinal cord injury in 1995, and died on 2004-OCT. The human body contains 220 different types of cells such as blood, brain, heart tissue, nerve cells, bones, etc. In 1998, researchers at the University of Wisconsin and the Johns Hopkins University in Baltimore MD found a way of harvesting stem cells from embryos and maintaining their growth in the lab. Stem cells are a type of primitive cell. Scientists have found ways of coaxing these stem cells to develop into most types of human cells, Researchers are confident that they will lead to treatments to many diseases: bone loss, broken bones, brain damage due to oxygen starvation, severe burns, cancer (some forms), diabetes, Lou Gehrig's disease, heart disease, hepatitis, incomplete bladder control, Huntington's, leukemia, lupus, muscular dystrophy, multiple sclerosis, osteoarthritis, Parkinson's, spinal cord injuries, and stroke! The Coalition for the Advancement of Medical Research estimates stem cell research shows promise to develop cures and/or new treatments for 100 million Americans who currently suffer from a wide variety of diseases and disorders. Research is opposed by many pro-lifers, mainly Roman Catholics and conservative Protestants. They feel that the embryos from which the stem cells are often extracted are human persons. Many believe that the embryos have a soul. Since the embryos are killed when the stem cells are removed, pro-lifers view the extraction procedure as murder and a type of Nazi-like medical experimentation on human beings. They generally have no objection to adult stem cells that are extracted from an umbilical cord, a child's body or an adult's body, if the appropriate consent is obtained. The first involves harvesting of stem cells from surplus embryos prepared for in-vitro fertilization procedures in fertility clinics. Hundreds of thousands of these are stored in clinics. The debate centers in whether they can ethically be killed in order to harvest their stem cells. A second ethical problem is whether stem cells lines which had already been created in the past from embryos, should be used in research today. Here, the embryos have already been killed. The only real matter to decide is whether federal funding should continue so that the resultant stem cells, which are already growing in laboratories, can be used. Embryonic stem cells are commonly extracted from unwanted, surplus embryos. These are typically embryos that are created during medical procedures in fertility clinics which help infertile couples conceive. When a woman undergoes in-vitro fertilization, she is given medication that causes her to produce perhaps two dozen mature ova. These are then fertilized, usually with sperm provided by her husband. About three days later, each embryo is at the blastocyst stage -- a collection of 4 to 10 cells. 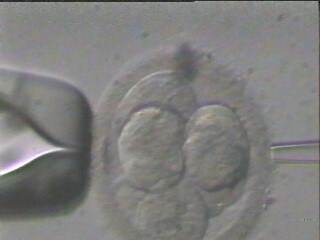 This photograph shows a seven-cell embryo which is fixed in position between two pipettes. Portions of six cells can be seen; the seventh is out of view behind the remaining cells. Two to five days after fertilization, two to four embryos are implanted in the woman's womb, in the hope that one or two will develop into a single newborn or twins. The rest are usually quickly deep frozen in liquid nitrogen for potential future use by the couple. Some are simply discarded. These are sometimes called "pre-embryos." They have no brain, central nervous system, mouth, heart, lungs, or other internal organs. They have no organs to see, hear, touch, taste; they lack a body, head, arms, legs; they have no self awareness, memory, thought processes, or consciousness. They are smaller than a pin-prick. They consist of a number of identical, undifferentiated cells containing human DNA. They do have the potential to grow into fetuses and become newborn babies. Many, probably most, pro-lifers believe that they are human persons with souls. Skeptics feel that souls do not exist -- in embryos, fetuses, newborns, children or adults. Fertile couples have children on their own, and have no need of frozen embryos. They might have the clinic implant in the woman's uterus an embryo formed from her partners sperm and either her ovum or the ovum of another woman. Frozen embryos would only be needed if the original embryos did not produce an embryo. The woman may be artificially inseminated with sperm from a stranger in order that the resultant child will genetically be partly her own. There would be no need to create embryos in the lab. The couple may accept a surplus frozen embryo formed by strangers' ovum and sperm, and left over from in-vitro fertilization procedures. This is called "embryo adoption." At this time, very few couples find this alternative acceptable. If a woman without a male partner wishes to become pregnant, then she will normally want to be artificially inseminated. Again, there is no need for frozen embryo. The surplus embryos will almost all be eventually be destroyed, even if it happens accidentally, decades in the future, due to equipment malfunction or human error. Research on surplus embryos in government labs is currently suspended. But if it were to be re-authorized, then researchers could remove some of these embryos from liquid nitrogen storage, thaw them out, and allow them to grow to the blastocyst stage. This consists of a collection of 100 to 300 undifferentiated cells, still lacking a brain, central nervous system, mouth, and other components as described above. The stem cells would then be extracted, killing the embryo in the process. If an artificial womb were developed, frozen embryos could be thawed out and allowed to develop into newborns. There are many more North American couples willing to adopt babies than there are embryos in the medical freezers. However, development of an artificial womb has its own unique ethical concerns. Some scientists reason that the unneeded surplus embryos should be used to benefit humanity rather than be simply discarded. Many pro-lifers regard these surplus frozen embryos as actual human persons with souls, deserving of protection, even if there is no practical way to have them develop into a fetus and later become a newborn. As of mid-2001, there were over 110,000 frozen, stored surplus embryos in the U.S. alone. 1 Some estimates in 2005 run as high as 400,000. The answer, as of early 2009 is no. In order to make embryo stem cells practical for therapeutic use, it would be necessary to create a new stem cell line for each patient that needs treatment. This is illegal in any government-funded laboratory in the U.S. It is being done in places like England and Korea, where researchers are now world leaders in this technology. At the current state of knowledge, creating a new stem cell line for mammals is difficult; for primates -- including humans -- it is particularly difficult.